New and exciting things are happening at Disneyland® Resort this summer! Pixar get a new home at Disney California Adventure® Park when Pixar Pier opens on June 23, 2018. 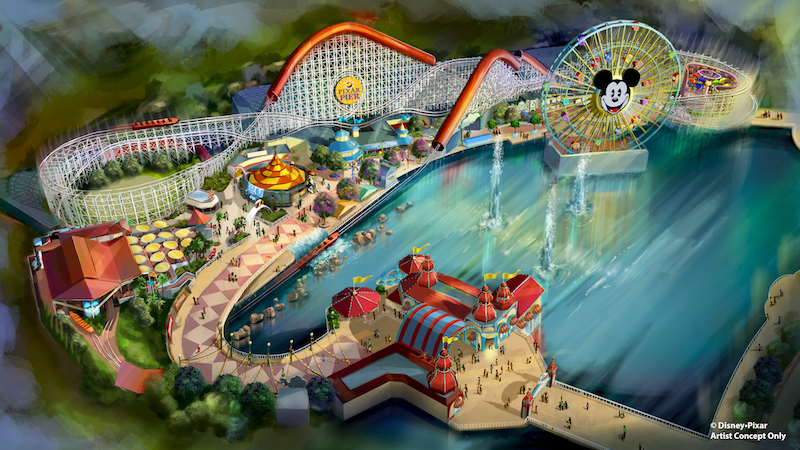 The area that is now Paradise Pier will be transformed into a seaside waterfront with the thrilling, new Incredicoaster, four new imaginative neighborhoods, the new Lamplight Lounge, plus exciting entertainment, themed food and beverage, and merchandise. At Pixar Pier beloved Pixar stories are introduced in this land through four whimsical neighborhoods. The first neighborhood is inspired by Disney•Pixar’s The Incredibles which opens with the new Incredicoaster. What used to be California Screamin’, the new Incredicoaster offers new character moments, new scenes and special effects, and an exciting musical score that connects the attraction’s story to Pixar’s The Incredibles 2 which opens in theaters June 15, 2018. The neighborhood inspired by Disney•Pixar’s Toy Story includes the popular Toy Story Midway Mania!® inspired by Disney•Pixar’s Toy Story films attraction. Another new neighborhood is inspired by Disney•Pixar’s Inside Out and a new Inside Out family-friendly attraction is scheduled to open in that neighborhood at a later date. A fourth new neighborhood offers a collection of Pixar stories. Mickey’s Fun Wheel transforms into a newly-themed Pixar attraction, allowing guests to enjoy the beautiful sights of Pixar Pier from 24 new gondolas – each one decorated with a beloved Pixar pal. The midway games are also inspired by Pixar characters from A Bug’s Life, La Luna and WALL·E. Opening at Pixar Pier on June 23 is the new Lamplight Lounge, a California casual gastro-pub offeringing unique signature cocktails and great food including lobster nachos. There will be a full bar with super waterfront views of Paradise Bay from both upstairs and downstairs. At night, outdoor seating will provide views of the illuminated Pixar Pier and World of Color. The remaining areas of the original Paradise Pier – including Paradise Gardens, Silly Symphony Swings, Jumping Jellyfish, Goofy’s Sky School, Golden Zephyr and The Little Mermaid ~ Ariel’s Undersea Adventure – becomes a new land called Paradise Park. To learn more, call your Glass Slipper Concierge travel advisor, or call 866-995-9857, or visit GlassSlipperConcierge.com.